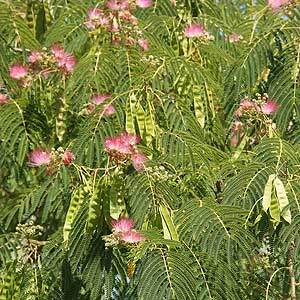 Valued for its pinkish feathery foliage, and long silky flower stamens in creamy white to pinks in summer Albizia julibrissin is a good as a shade tree or screen tree. A large deciduous shrub to small tree, widely spread in its native habitat from Iran through Asia to China. Reaching up to 12m in height although often much smaller and often at 4 – 6m. It is the pink silky flowers that give the tree its name. Care it relatively easy, a humus rich well drained soil is best, mulch to retain moisture and a cool root run. Best planted in a position where they are protected from strong winds as they are susceptible to damage. Water Albizia julibrissin or ‘Silk Tree’ as it is commonly called, well when young, however once established these trees are hardy and will tolerate dry periods. Prune to keep in shape, the best time for pruning is in spring as new growth begins. Remove damaged or diseased wood and then prune to maintain shape and size. These trees actually take well to being trimmed and trained and can be used as an espalier if required. With a long flowering period from summer through to autumn the early season flowers are the most attractive. The seeds are coated in a hard outer shell and germination can be slow, many growers scarify the seed or use chemical treatments to speed up germination. Chinese herbalists are said to use the bark and flowers of the tree to make a tea that is purported to have medicinal uses. Propagation from root cuttings is also possible, and desirable to promote especially good forms.